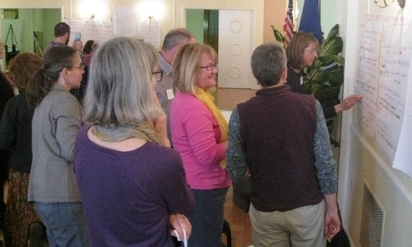 Thanks to the over 100 attendees who came to our Community Health and Climate Summit. Please see our 4 page recap of the Summit Panel and Breakout discussions HERE. The Panel Presentation aired on MCAT Nov. 29 and Nov. 30. The program is now viewable on MCAT's Video on Demand. If you are looking for the Missoula Invest Health maps that Lisa and Mike presented, the link is HERE. Nick's climate projections from the Montana Climate Office will not be finalized until the summer. His overview and conclusions are HERE. The Summer Smart Initiative which Amy detailed is all available on that section of this website. The animated film is HERE. See below for Summit event details. We now have a Health and Climate Resource page! WHERE: Governor’s Room in the Florence Hotel, downtown Missoula. WHAT: A breakfast Summit featuring an inspiring panel of community leaders followed by a breakout group discussions around ~ 10 topic areas. WHY: Enhance our community’s ability to understand, prepare for and respond to health issues and changing climatic conditions, thereby deepening connections and building a healthier, more equitable, and stronger community over the long-term. WHO: Sponsored by Climate Smart Missoula. Convened by Mayor Engen and community partners. HOW to join: All are welcome. RSVP required and space is limited. 10:15 -- Stay and mingle over another cup of coffee, or head off to make Missoula a better place, which we know you do everyday. PANEL – A visually rich look at Community Health and Climate Change in the Missoula Area. Mayor John Engen, welcome and convening thoughts. Nick Silverman, PhD, Research Scientist, Montana Climate Office. Where are we headed? New release of climate projections for this region developed for Montana’s Climate Assessment. Samer Khodor, MD, Physician Exec Ambulatory Services, Providence St. Patrick Hospital. Weaving together climate projections, vulnerable populations and health risks. Amy Cilimburg, Director, Climate Smart Missoula. Showcasing climate resiliency outreach and collaborative solutions stemming from the first season of “Summer Smart”, including the release of a new, short, animated film. ​Table Discussions via Facilitated Breakout Groups. Healthy homes and residences – what do we have and what do we need? Emergency preparedness and shelters – what do we have and what do we need? ​This Summit hosted by Climate Smart Missoula with financial support from GCS, American Lung Association in Montana, and the Institute of Health and Humanities. ​This event has also been made possible by the Bloomberg Award for Partners for Places to Climate Smart Missoula for “Summer Smart”. This award is a partnership with the City of Missoula and was matched by community partners, including Providence Saint Patrick Hospital, Missoula Federal Credit Union, the Llewellyn Foundation, Community Hospital, The LEAW Foundation, Providence Montana Health Foundation, Sunburst Sensors LLC, WGM, other conservation groups, and myriad individuals. For more information, email Amy.